Recently I took my grandsons on a weeklong camping trip. We were going to be camping in a tent, in central Mississippi during the month of June. The weather forecast said that the temperature would be in the mid 90 degree range with 70 to 90 percent humidity all week long. I learned a long time ago about the importance of staying hydrated. Many years ago, I spoke to my doctor about the best way to stay hydrated during the summer. She told me that in the summer humid climate of the southern United States, you should walk around with a container of water in hand at all times when you are outside conducting any activity. She also told me that by perspiring so much you lose a lot of electrolytes. It is vitally important that those electrolytes be replaced. She stated that for every 3 to 4 bottles of water you drink, you should drink something to replace the electrolytes that is lost through perspiration. She stated that if you wait till you become thirsty; you have already started to become dehydrated. 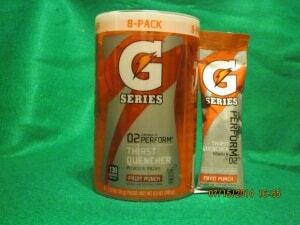 I have developed a taste for an electrolytes replacement drink called, “Gatorade” in the fruit punch flavor. I usually purchase the 3 pound, 3 ounce container of the powdered “Gatorade”. I then mix the powder in a half gallon pitcher and either place that pitcher in the refrigerator or put some ice in the pitcher. This works great when I am working around the house on “Honey Do” projects. Just a little bit of trivia. In case you did not know, “Gatorade” was developed by the University of Florida for their football team, the “Florida Gators”. Thus the name, “Gatorade”. It worked so well for their football players, it was made commercially for the general public. Before we left on our camping trip, we stopped at our local Wal-Mart to purchase our supplies for the week. We picked up two (2) cases, of 36 bottles each, of 16.9 ounce bottled water. I planned on the three of us taking this bottled water in our day packs when we went hiking, fishing, swimming or any other time we did any activity away from our camp site. I then walked down the aisle to where the “Gatorade” was located. I picked up my normal 3 pound, 3 ounce container of the powdered “Gatorade”. Then something caught my eye. 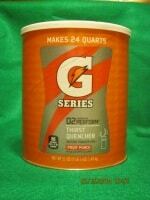 I noticed that “Gatorade” now made a container of 8, 1.23 ounce packs of powdered “Gatorade”. The instructions state to pour one 1.23 ounce pack into a 20 ounce bottle of water. This is the first time that I have seen this product in our Wal-Mart. So I picked up a container of 8 packs to evaluate on our camping trip. I figured that instead of carrying just bottled water, we could carry some packs of “Gatorade” in our day packs. Then when we needed to hydrate with “Gatorade”, all we had to do is pour one, 1.23 ounce pack of “Gatorade” into one of the bottle of water that we were carrying in our day packs. This worked great for all three of us. I know someone is going to say but Coach, the instructions say to place one 1.23 ounce pack into a 20 ounce bottle of water and you purchased 16.9 ounce bottles of water. You are correct. However, it tasted great to us. I am sure that for the frugal minded people out there, you could buy the 3 pound, 3 ounce can of “Gatorade” power and make small zip lock bags of powdered “Gatorade”. It just seems like a lot of work to accomplish something that is already made for you. NOTE: I DO NOT receive ANY compensation, of ANY type, from ANY company or manufacture, for mentioning ANY product, named in ANY of my articles. I write about things that work for me. 5 things on my mind….. I drink Crystal Light lemonade but hate it full strength because it’s just too sweet for me. What I do is just poor a splash from the pitcher in my glass and then dilute it to taste. Same idea. You can also make your own Gatorade by adding 2 tablespoons of sugar, 1/2 teaspoon of sea salt to water to make a home made electrolyte replacement. You can add some of the flavored drops if you need some extra flavor, but this will work for you. P.S. Rourke, I still get rejections when trying to email you. I have found that a half of a single serve packet in the 16.9oz. water bottles is sufficient. Using a full packet is way too sweet for me (I also use the Crystal Light). Monopotassium phosphate, MKP, KH₂PO₄, is a soluble salt of potassium and the dihydrogen phosphate ion which is used as a fertilizer, a food additive and a fungicide. No thanks. To try and get things back on subject 🙂 What do people like to drink when they are dehydrated or exerting themselves? Do people drink other things than Crystal Light, Gatorade, or water? And of so, do you have a recipe for making it yourself so there are no additives that may not be the best for you? What is the advantage of the powdered Gaterade over just buying a bottle of it? Is it just cost? I can see having the powdered on a long hike if you’re not carrying all the water on you and you’re planning to filter some in the field. You need to watch the sugar content of Gatoraid. Its good for sports, but when doing the weekend with it, the sugar actually messes you up. A doctor in New Mexico pointed that out to me. I’d use the sugar free version – still get the electrolytes, but no sugar. I use the the Gatorade packets in my (GHB & BOB)’s. For me it’s a situation of short term needs and a reduction in (Weight, Bulk and Calories) is a no brainer. While I agree with (bc) you pick your poisons. Some of the Crystal light stuff has (Aspartame) in it too. Obviously you live with your choice, I live with mine. Brad, I have used water, gatorade, powerade, lemonade, but my favorite, fastest acting “rehydrator” is V-8 juice, 12 oz, works like magic for me. My homemade version of gatorage is table salt, sugar and lite salt (the potassium chloride one)- got to balance the sodium with potassium to be safe. I was never really a fan of gatorade … didn’t care for the taste so I stick to water. I am probably in the minority here. In response to Novice, yes, I buy powdered Gatorade because of the savings over buying the bottles. I dehydrate quickly in hot or humid weather, and I also have a juvenile diabetic in residence who needs to be able to maintain her sugar levels when she’s too sick to eat solids. With college kids running in and out, our bottled Gatorade disappeared as fast as I could buy it. When someone has to take the time (gasp!) to measure and mix powder with a little water, suddenly no one’s all that thirsty! The powdered Gatorade isn’t available in nearly as many flavors, but it’s more convenient on so many levels.